I promised and here it is. For many years I have looked at induction cooktops (hobs) for brewing but they all lacked one thing…accurate temperature control. Temperature modes measured the glass top beneath the kettle and not the contents of the kettle on the induction hob. Temperature control was haphazard at best…until now. A few months ago I was doing a web search for induction beer brewing to see if anything had changed in the technology. After going through many search results I came across a websites blog entry about sous vide cooking and beer brewing. It was on a website belonging to Oliso. Oliso has been a manufacture of speciality irons for clothing and quilting. They recently delved into induction sous vide cooking. Now sous vide cooking requires accurate temperature control of a water bath for extended periods of time…hmm sounds a little like brewing. I started reading the blog entry and it was written by an Oliso staff member that was a home brewer and it detailed his one gallon batch brew day using the Oliso SmartHub and Top. I was intrigued and looked at the details about the SmartHub and Top induction sous vide cooker. Impressive, time and temperature control. Temperature control in one degree increments! It is based on a 120 volt 1800W induction hob so useable anywhere. I quickly shot off an email to the company with questions about the appliance and explained my interest, background and advocacy in small batch brewing. The great folks at Oliso quickly emailed me back with answers and questions of their own about small batch brewing. A few email exchanges and we setup a phone call to discuss more. I was as excited about their interest in brewing with the SmartHub as they were. The culture at Oliso has been and is that of making products that are what their customers want and the SmartHub is the result of that. How many companies want to know what you want as opposed to those that like to tell you what you need. Well the people at Oliso offered to send me a unit to use, brew with and send them feedback. As you followers of my blog know I am not a big product reviewer/endorser but this was pretty exciting. They wanted my honest opinion about it for brewing. That was fair, they already had a great sous vide cooking system with great reviews. What is the Oliso SmartHub + Top? Well the SmartHub is a 120 volt 1500 watt induction cooktop/hob. It has a large glass induction heating surface, touch controls and quiet cooling fan. It, in itself, is a quality induction hob but it’s the Top that sets it worlds apart from other induction hobs. The “Top” is an induction compatible stainless 12 quart sous vide vessel with glass lid and an internal temperature sensor. Yep, when sitting on top of the SmartHub it measures the temperature of the contents of the vessel. The “Top” comes with a sous vide bag rack which also keeps your brew bag off the bottom of the vessel. On the front is a series of LED lights to indicate heating. Some folks are mashing there small batch brews with sous vide “sticks” and having good luck but there is the cleaning concerns, bags and grain getting sucked into the circulator pumps etc and then you still have to boil on the stove. The Oliso SmartHub doesn’t have a circulator pump and it does just fine without one and it adds to the simplicity of the product and to the BIAB process. It was time to test it and brew! I needed a BIAB bag so I ran to the hardware store to get a couple 5 gallon paint strainers. In a pinch they worked and with a little coaxing the elastic top of the strainer bag fit snuggly around the Oliso. There are several better brewing bag options out there but the paint strainer bags were quick to find and worked fine. I did a simple single malt single hop beer with a grain bill of around 4 pounds for 1.25 gallon batch size. I started with tap water at 56 degrees and set the Oliso SmartHub to 154 degrees. It was very quiet during operation and took only 25 minutes to bring the strike water to 154 degrees. I mashed in and the temp dropped only 3 degrees so the unit quickly recovered to the set temperature. For the hour mash I stirred the mash every 15 minutes and checked the mash temp with a dial thermometer I knew to be accurate. Pleasantly surprised to see the temperature was spot on each time. During the hour long mash the Oliso only cycled heat on approximately six times with lid off. The heating cycle while in sous vide mode (enters that mode automatically when the Top is placed on the unit) is gentle pulsed on/off similar to a PID controlled heating element. When the mash was done, used timer to remind me, I pulled the bag of grains out and gave it a good squeeze to get as much of the liquid out as possible. Next was boil time. The SmartHub restricts the max temp to 194 degrees in sous vide mode by design but it is easy to get around this by carefully lifting the Top up at the front and slipping a piece of paper under the front edge. This interrupts the electrical contacts of the Top and the SmartHub now thinks there is just a normal kettle on top. Right to full power mode to get to boil. It took approximately 20 minutes to reach a good rolling boil. I did heat with lid on to speed up the process and removed it when it started boiling. I was able to turn power down to about 80% and still maintained a nice boil for the hour. Hops for this recipe where added at 30 minutes into the boil (again used the timer feature to remind me). At the end of the boil it was time to cool. One could cover it and let sit to cool but I had a small 12.5 foot compact copper immersion chiller from Coldbreak Brewing that fit perfectly. I had it left over from stove top brewing. After the wort was cool I simply used a mini auto siphon to siphon the wort into my bucket fermenter. I hit my original gravity number and a little over 1.3 gallons into the fermenter. Brew day done in 3 hours including clean up. Cleaning was a piece of cake, a little dish soap and sponge and the SmartHub Top was clean. I was impressed and using the SmartHub with the Top was easy and intuitive. After the brew day was done I sat down and went over my brew day observations and there were only two things I missed with the Oliso SmartHub and Top compared to my electric brew kettle. That was a drain, I’m spoiled having a drain valve on my kettle. Since it isn’t specifically designed for brewing I understand the drain omission and it really isn’t a big deal in my opinion. The second was a way to support the grain over the vessel to drain instead of holding it and/or squeezing. I emailed Oliso with my observations and suggestions and they immediately replied “we have a perforated steamer insert pan” that could support the grain bag to drain! I got one in the mail and on my next brew I used it and it was great. I just placed it on top of the sous vide Top and sat the grain bag in it to drain as I began heating it to boiling. It could be used to gently sparge the grains a little if you wanted to get a little more efficiency. Oh yeah you can use it for what it was made for and steam veggies or shellfish. After the second brew day I put a couple steaks in ziplock bags and cooked them to perfection while working on this post. Used a fry pan on the SmartHub to add a little sear to the steaks and they turned out incredible and complemented the first beer made on the Oliso. If you haven’t tried the sous vide cooking process I highly recommend it! There are details and recipes all over the internet. Later, after getting the steamer insert, I steamed up some Pacific NW mussels and enjoyed them with the scotch ale I made with the Oliso…wow what a great pairing! Check out the video from one of the brew days on my YouTube channel Small Space Brewer Be sure and subscribe to my channel to get updated when I post new videos. Will I get rid of my electric brew kettle? Probably not as I made it specifically for my brewing style and the small space I brew in. I really like the Oliso and it’s versatility and it is definitely a very good solution for small batch brewers that also enjoy cooking. It’s also ideal for those of us with limited kitchen space. Would I buy one? Absolutely for the all the reasons above and I have been enjoying this one. Oh yeah, I almost forgot the most important thing…the beer turned out great, simple and tasty. Stay tuned as there may be more exciting news related to this. If you have checked out my blog you probably have noticed that I am a small batch home brewer. I love it and it works perfectly for me and my situation. Small batch home brewing has really taken off and offers so much for the new home brewer and experienced brewer alike. 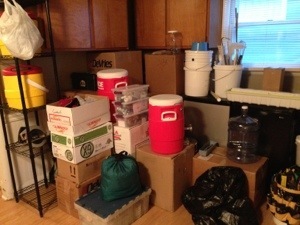 It also fits the needs of those with limited space that want to brew their own beer or even make their own hard cider. Recipe and starter equipment kits are available from the majority of the online home brewing retailers such as Williams, Austin Home Brew, Northern Brewer, Homebrewstuff and Midwest Supplies as well as the company that really pushed small batch home brewing into the market, The Brooklyn Brewshop. Your local home brew shop should be able to help you get started as well and provide you with advice on brewing in general. I am a big advocate of supporting local home brew shops as they are small businesses that support the hobby. Many were there long before online ordering was around. The process of brewing beer is the same for one gallon as it is for 5+ gallons. The equipment is a little different but only in regards to size. Any of the equipment used for brewing 5 gallon batches can be used to brew smaller batches but there are distinct advantages to using equipment sized for small batch brewing. For example the mini auto-siphon is so much easier to use in a one gallon jug than a standard auto-siphon, small fermenters allow for less headspace thus eliminating excessive exposure to oxygen but the best reason for smaller equipment is that it takes up less space. All beer needs to be boiled as part of the beer making process, it kills bacteria and helps to utilize the bittering components of hops. Fortunately pretty much any kitchen stove will easily boil two to four gallons for small batches. This is a big advantage over five gallon batches which start with at least a 6 gallon pre-boil volume and that usually sends home brewers outside with a large propane burner. What do you need to start? Well you can purchase a starter equipment kit but I compiled a list of what I have used on pretty much every batch I have ever made. This would be the minimum I would recommend and most of it is included in the better starter kits. Not a lot of money has to be spent for the basic necessities. 5 gallon bucket for soaking/sanitizing bottles/equipment and using as a bottling bucket and a place to store most of your equipment. Generally speaking for Brew In A Bag (BIAB) style brewing you would want a kettle that is 2 to 2 ½ times as large as your recipe size to fit all the grains and the full volume of water. That rule of thumb is good for extract brewing also as it provides room for a full volume boil. So for 1 gallon batches you would want a kettle that is 12 quart, for 2 to 2 1/2 gallon batches a 20-24 quart and 32 quart for 3-4 gallon batches. Aluminum, stainless steel or graniteware are all acceptable. For folks wanting to try one gallon batches there is a pretty good chance you have a large enough pot/kettle in your cupboard already that you’ve been using for pasta or soups. Based on your batch size these would be the recommendations for fermenters. Any regular beer bottles that do not have the twist cap, 12/16/22 oz all work fine. You can get new or save your empties after enjoying a good craft beer variety. Swing top bottles are convenient and available in many sizes. I do not recommend bottling in glass growlers as they are not designed to handle the higher pressures that can occur during bottle conditioning, as opposed to just storing poured beer, and can become a bottle bomb. Some have successfully done it but it is not worth the risk. I also would stay away from plastic bottles such as 2 liter soda bottles as they can absorb oxygen over time which will adversely affect the beer if you wish to age it. Kegging small batches? Yes you can! If you are looking to keg instead of, or in addition to, bottling your beer you are in luck as there are several good options now for small batches. There is a greater initial cost to get started kegging but the equipment is reusable and will last for years. There are two options that I will mention as they do serve the purpose but are getting harder to find and that is the Tap A Draft System and the Party Pig System. Both use a PET plastic bottle as the storage/dispensing vessel. 5 liter Mini Kegs are another option, but again, they are harder to come by and the kegs have a limited life as the lining of the kegs begins to breakdown with time and use. The best solution, as it follows the standards of current kegging systems, is the corny style kegs and CO2 tank and regulator. Several companies are now offering corny kegs in 1.75, 2.5 and 3 gallon sizes. They all use standard ball lock fittings so they have a lot of options for expanding and dispensing. Force carbonating is also possible with these systems. Another option that I have recently discovered and like using (especially for one gallon batches) are the new mini keg style stainless growlers. They are available in 1/2 gallon and one gallon sizes. They can handle pressures of 25 psi, easy to clean/sanitize, don’t break and are very portable so you can take your home brew to a friend’s house and they fit in your kitchen refrigerator! You can bottle condition in them or force carbonate with the right CO2 attachment. There are even faucet taps available for these. Plus you can always get them filled with your favorite craft beer and keep it carbonated for more than a couple days. Many brewery taprooms sell them and they are also available on eBay along with matching tap/CO2 options. Hopefully this has given current and prospective small batch brewers some information and food for thought. Another great home brewing blog…check it out! Well it has been way too long since posting anything but life has been busy. I just moved to Grand Forks North Dakota and getting settled in. A lot of my brewing equipment is still in boxes but hope to be brewing very soon. Grand Forks ND is a smaller college town but I did find a local food co-op that has some home brewing supplies and ingredients so that is a plus. Not a huge selection but the necessities and from what I hear standard shipping from Midwest and Northern Brewer is only one day since we are so close. Also met up with a couple members of the local home brew club the Uffdah Brewers. Great guys and good valued info about the local home brewing and beer scene. As far as brewing goes the tap water is cold for quick wort chilling but high in alkalinity so bottled water will be a necessity. The place I am renting has more than adequate electrical service for brewing, even being an older home, so that is another plus. A lot of upcoming changes to my brewing plans to fit smaller spaces, the use of 120 volts instead of 240 volts for future brewery projects and my never ending quest to find the ultimate insulated mash tun so stay tuned for more on that. Next post will not be as a long of wait, I promise. Visited the Freemont Brewery is Seattle this weekend and enjoyed a pint of their Pale Ale amongst the sea of conical fermenters. Welcome! My blog is dedicated to my journey into home brewing. I will post details of my system build progress, tips, interesting links, recipes and more.